When you select your dates and click "RESERVE" you will be taken to our Secure Booking Gateway hosted with GuestLink. 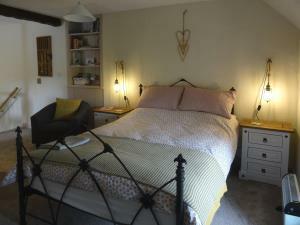 Ty Capel limits bookings to 2 or more days. Our delightful, and newly completed, 1st floor open plan holiday apartment is now open for the 2018 season. Occupying the entire upper floor of our cottage, with it's own private entrance, it features a double bed, separate shower and wash rooms, and a small kitchenette. The south facing garden overlooks the northern hills of the Pumlumon Massif in the Cambrian Mountains. If you wish to bring your dog, you must contact us before booking!